This Applied Science Concepts Kit provides a completely safe and convenient method for students to test and observe the characteristic properties of acids and bases. Activities incorporate the LAB-AIDS® Chemplates®. This unique lab tool eliminates the need for glassware and provides a semi-micro environment in any classroom. Students perform seven activities such as reacting metal and carbonates with acids, producing, collecting, and testing carbon dioxide and hydrogen in safe quantities, observing the effects of acid and bases on indicator dyes, measuring the concentration of acids by titration of an “unknown,” and performing a neutralization experiment. 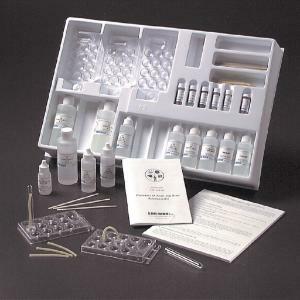 Ordering information: This kit includes Chemplates® with a spatula and gas collector cap, gas-delivery tubes, sodium hydroxide, test tubes, hydrochloric acid, empty water bottles, "unknown," wooden splints, acetic acid, phenolphthalein, limewater, calcium carbonate, copper, iron, magnesium, litmus paper (neutral), and zinc.